DALLAS -- The Dallas County sheriff's deputy who went into the apartment where an Ebola victim was living has tested negative for the virus, state health officials said Thursday. The Texas Department of State Health Services released the results in a tweet Thursday afternoon, one day after Michael Monnig was taken by ambulance to Texas Health Presbyterian Hospital. The hospital said earlier in the day that Monnig was in good condition and being kept in isolation. He did not have a fever, vomiting or diarrhea. Monnig was one of the deputies who went inside the Dallas apartment where Thomas Eric Duncan was staying. Monnig did not have contact with Duncan, but served the quarantine order on Duncan's family members, who are now in isolation, CBS Dallas reported. Duncan died Wednesday at the same hospital where Monnig is being treated. He was the first patient diagnosed with Ebola in the U.S. Duncan's remains, which continue to carry the virus, will be cremated. Officials say none of Duncan's relatives have shown any signs that they are infected. Monnig's son told CBS Dallas that the deputy was feeling fatigued and had flu-like symptoms, which are similar to what Ebola patients experience in the early stages of sickness. 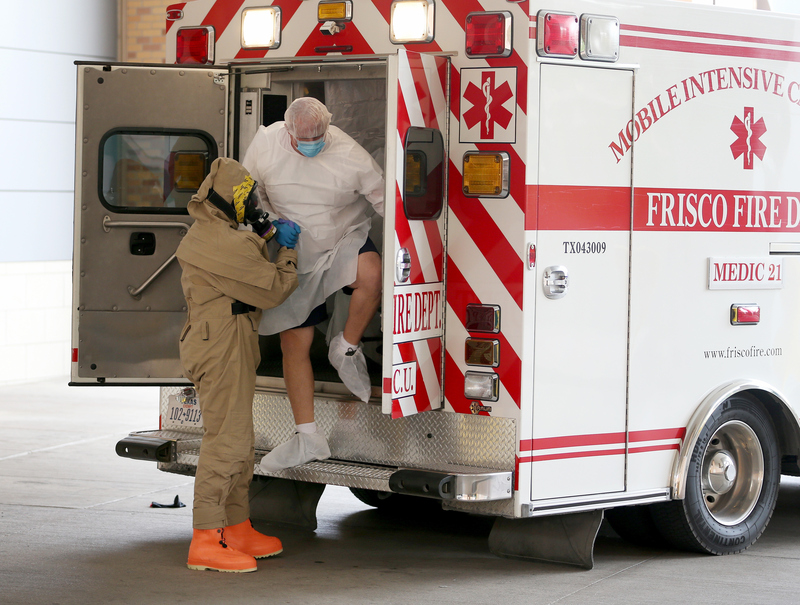 Monnig went to a CareNow clinic in Frisco on Wednesday complaining of stomach pains, and told the facility's personnel about his contact with the Ebola patient. Doctors at the clinic felt that Monnig met the preliminary guidelines for Ebola as given by the Centers for Disease Control and Prevention and sent him to the hospital "out of an abundance of caution." However, family members maintain that there is no cause for concern. "He was in the apartment for 30 minutes. We were told there was no way he contracted the virus," said son Logan Monnig. "We're very, kind of scared, just want to make sure he's okay." The deputy was not among the group of nearly 50 individuals who were being monitored by health officials, because he had no direct contact with Duncan. Dallas County health director Zach Thompson said that Monnig is most likely just sick with the flu. Crews have finished cleaning the hospital room where Duncan was treated before his death, along with the hallway leading to that room. Any trace of the Ebola patient is now gone, except for some hospital equipment that was used during his stay. The 15-member hazmat crew bagged up everything -- including bedding materials and Duncan's clothes -- for another company to retrieve. The items will then be burned.